It was really no April Fools joke. The official start of business the KIESS GmbH & Co. KG was calculated on the 04/01/1974. The staff of 3 persons had a reason to rejoice. They were welcomed by the wife of the only male counterparts with a bouquet. It was the only decoration in the open-plan office with about 20 m² located Blumendellerstraße in Mülheim-Heißen. Desks and other office furniture had to be bought for as much as 50 DM and picked up by the Krupp in Essen-Borbeck. Below the open-plan office garages were rented as store and workshop. The small team around engineer Karl Heinz Kieß started with great optimism. At the end of the year they could proudly look back on a turnover of DM 1.8 million. A workshop was rented additionally. The now grown to 5 employees team felt each task to be solvable ... only miracle lasted a little longer. Already in 1976, everything was too small and the company moved into new rooms (120 m² of office space, 800 m² hall) ) in Elbestr. 31-33 at Mülheims harbourarea. Sale and purchase were divided and a design office was set up. The team was now grown to 10 employees. Consulting, service and sales expanded on the entire country. Because of to the activities and contacts of different customers now more business abroad was settled, such as Belgium, the Netherlands, Iran, Dubai and Abu Dhabi. Meanwhile KIESS had gained valuable experiences. Problems occurred with the use of steel shot to sandblast bridges, because this sandblasting material rapidly corroded by rain. The ban on quartz sand and the increased demands on the environmental protection increased the technical requirements for the sandblasting and coating. Problems with abrasive and dust disposal, coating and cooling with heat recovery were economic challenges for the engineering team of KIESS .In 1978, the stationary sandblasting grew in size. KIESS received an order from Krupp Steel and Industrial Technology at Duisburg-Rheinhausen. A 10 m high large sandblasting hall with a total area of ​​280 m² and a fully automated underground transport system was built by KIESS. Furthermore the Mülheim specialists developed and built automatic sandblasting units. All system elements are developed or modified in Mülheim to meet the tough demands of sandblasting. For capacity reasons, the location had to be changed again soon. In May 1985 on a 10,000 m² ground in Wiehagen 25 in Mülheim-Heißen, the current headquarter was opened. Immediately after reunion KIESS started activities in the new federal states with staff from the region. At the end of the 80s, the demand for environmentally safe technology increased. KIESS was known to develop low pollution humid blast-cleaning units. In this particular method the dust produced during sandblasting is bound up to 98%. Particular attention was paid to the development of abrasive recycling facilities for sandblasting. An equally ecologically and economically interesting matter if you consider that the high costs of waste disposal and garbage dumping of slag abrasive. One of these exemplary recycling plants, which allow reusing the abrasive up to 200 times, was e. g. successfully established for the redevelopment of the Island Bridge Rahde (motorway 7 Hamburg-Flensburg). What is the secret of this German success story? According to company founder Karl Heinz Kieß one reason could be that "we never will put the head in the sand and claim" but will solve the different tasks in close cooperation with the customer. It is a good feeling for the German engineers not to have finished with the sandblasting technology, but to constantly pursue new ideas. Thus different tasks such as High-performance vacuum cleaners, filter systems and recycling facilities have been developed. The focus of all of these ideas is the desire to achieve optimal performance and profitability. Early 90s KIESS intensified contacts in the CIS countries. There were employees hired with Russian as their native language to open up the market for KIESS . Autumn 1992 a need from Siberia was approached to KIESS . 250,000 square meters of steel surface should be sandblasted according to the purity of goodness SA 2.5 and coated under the worst climatic (-20 degrees) and geographical conditions. 1993 KIESS received its biggest order in the company’s history: KIESS delivered the technical equipment for six sandblasting halls with coating facilities for ship segments and two halls for sandblasting and coating small parts for Kvaerner Warnow Shipyard in Rostock-Warnemünde. In August 1998, the certification according to DIN EN ISO 9001was achieved. In the following years KIESS became one of the most experienced suppliers in the field of corrosion protection. All German shipyards were equipped with KIESS -products. Around the world, whether in Singapore, Dubai and Saida in Russia you will find KIESS-systems. 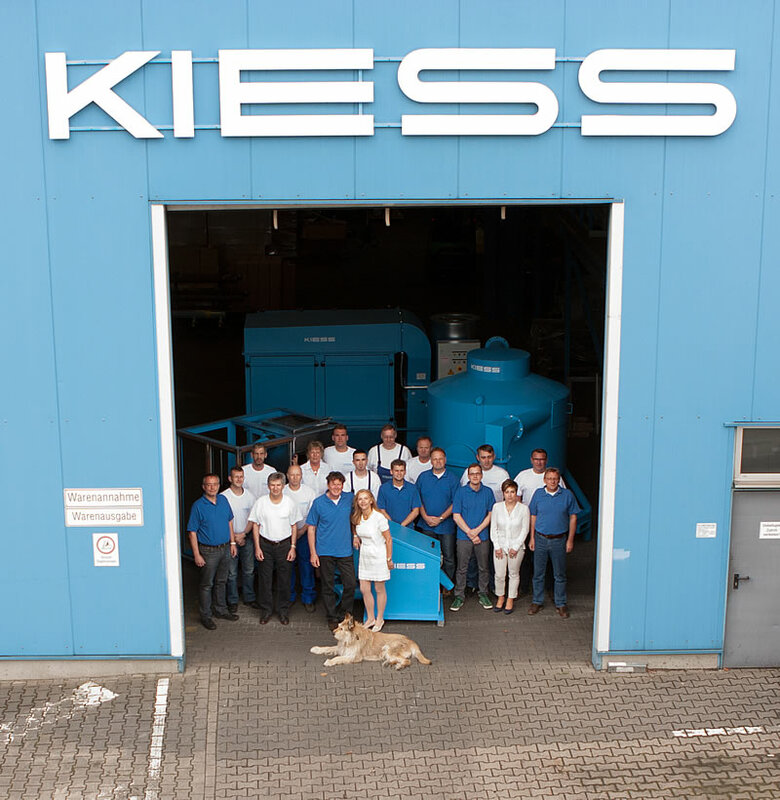 2002, the daughter of the founder, Heike Kiess and her husband, Tomas Kohut took over the management of KIESS GmbH & Co. KG. They lead the company with great success till today. The company founder Karl Heinz Kieß died after a long illness on 25/03/2004. Currently KIESS could provide a sandblasting and coating system for components in the field of offshore crane technology and put into operation successfully. The system concept consists of two combined sandblasting and coating buildings with dimensions of 30 x 15 x 15 m. Wind energy in Germany is now the most important renewable form of electricity generation, before the production of electricity from hydropower. For this young new brand KIESS could deliver eight large sandblasting halls and eight large coating plants, sometimes combined, in shortest time. These systems are designed primarily for the offshore wind energy. The conversion of old, already existing, sandblasting plants into modern and efficient systems develops a growing market for the production of steel towers and foundation beams. All this is only possible with loyal and committed staff, and close cooperation with customers who demand the company KIESS always new.